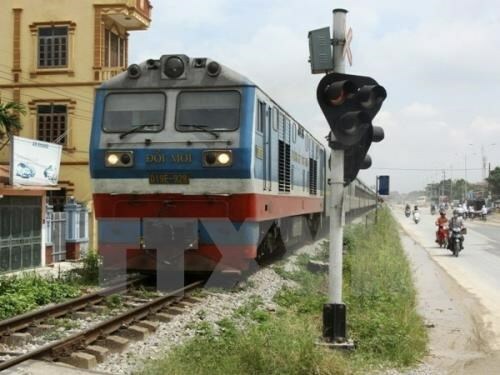 Hanoi (VNA) – The Hanoi Railway Transport Joint Stock Company (Haraco) has successfully conducted a trial run of an international container train connecting China’s Guangzhou province and Hanoi’s Yen Vien town. The project is an outcome of cooperation between Haraco and China Railway International Group Limited along with China’s Da Shun Fa transport agents and Vietnam’s Trung Viet Company. After the trial run, Haraco and the Chinese group agreed to sign trust and agency contracts in transporting goods between the two countries and to the third countries. Initially, there will be two return trains every two days. A train containing 20 carriages will travel a distance of about 1,000 km in 30 hours. Director General of Haraco Tran The Hung said the launch of the first international trains in the north opens up potential in exploring and increasing the market share of the railway transport sector, not only cargos imported from China but also domestic export products.